Ramsey manager/goalkeeper Lea Jordan slides out to thwart an attack from Netherton United A. Photo: David Lowndes. It’s all set up for a cracking Peterborough Premier Division showdown at PSL tomorrow (April 11, 7.45pm kick off). Leaders Peterborough Sports Reserves will host third-placed Pinchbeck United in the big match after both recorded comfortable 2-0 home wins on Saturday (April 8). Action from Ramsey's 6-1 win against Netherton United A (red) at the Grange. Photo: David Lowndes. There’s just a point between the teams and both have 10 games to go. Moulton Harrox are sandwiched between the sides on the same points as Pinchbeck, but they have just eight games remaining after their 5-0 win over AFC Stanground Sports. Karl Gibbs, back in action after a host of weekend work commitments, and Andy Boome scored for Sports against Stilton. Callum Lawe and Liam Ogden were on target in the first-half for Pinchbeck against Ketton, while Marcus Parry (2), Dan Woods (2) and Joe Townsend were the men on the mark for Moulton. Netherton United are clear in fourth after following their midweek win over city rivals ICA Sports with a 5-0 drubbing of Leverington. Action fromn Netherton United A v Ramsey at the Grange. Photo: David Lowndes. Leverington upset Sports last weekend (April 9), but Tom Randall’s hat-trick ensured this one went with the form book. Peterborough Northern Star striker Jezz Goldson-Williams and skipper Herbie Panting also scored. ICA recovered to win 3-0 at Crowland with goals from Dave Kilby, Vaides Macianskis and Harley Williams, while Thorney edged further away from relegation trouble thanks to a second-half winner from George Edwards at Deeping Reserves. The fantastic form of Stamford Lions and their star striker Luke Ball continued with a 4-0 win over Holbeach United Reserves. That’s 12 top-flight wins in a row for Lions who have shot up to fifth in the table. Ball has scored 12 goals in his last five Premier Division matches, including three hat-tricks, the last of which arrived against Holbeach. Dan Morris scored the goal as Langtoft United won 1-0 at Wisbech Reserves, while Sawtry crushed bottom club Uppingham Reserves 6-3. Whittlesey Athletic Reserves have enjoyed a splendid few days. 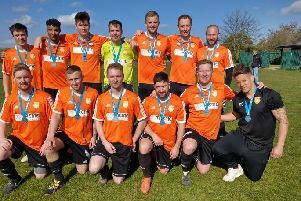 A winner in extra time from veteran Ricky Hailstone secured a 2-1 win in the North Cambs Junior Cup Final against Chatteris Town at Wisbech Town FC. Robert Hembridge also scored. And they followed that up with a 15-0 win over a nine-man Long Sutton Athletic team in Peterborough League Division One on Saturday. Jack Flintoft scored six goals in that game with Hailstone and Jack Carter claiming hat-tricks. Ramsey Town returned to the top of Division Two with a 6-1 thumping of Netherton United A at the Grange. Adam Rothery (2), Jamie Baxter, Joshua Rust, Lewis Stone and Adam Taylor scored the goals. Wisbech Town Res 0, Langtoft United 1 (Morris).